Here's some much-needed good news: one of the most beloved burgers in Chicago (and the country) will make its way to NYC for exactly two nights. 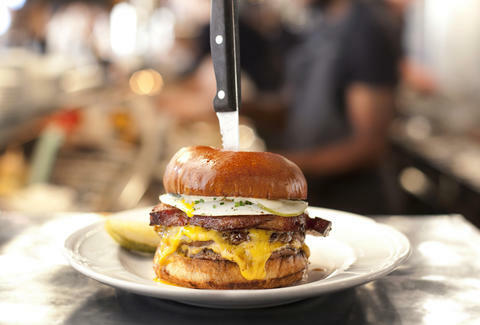 On October 9th and 10th, the most blessed New Yorkers can get Chicago's Au Cheval burger at Chefs Club by Food & Wine. The first night it'll be the star of the show; the second night, it'll be served in beautiful burger harmony alongside the Emmy Burger from NYC's own Emily. The Emmy Burger is, of course, NYC/Instagram burger royalty, made with a dry-aged Fleishers' patty, Grafton cheddar, caramelized onions, and buffalo-esque Emmy Sauce on a pretzel bun. Each burger will cost $18 ($6 more than a regular double at Au Cheval, but $8 less than what you'd pay in-house at Emily). You can make reservations for both nights on OpenTable, though we'd imagine they're going to go pretty fast. Godspeed. Lucy Meilus is Thrillist's New York Editor and is still screaming. Follow her on Twitter and Instagram.